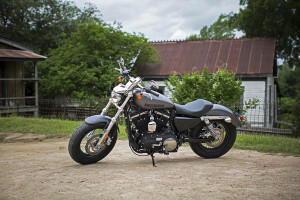 The 2016 Harley-Davidson 1200 Custom is one classic bike! The Harley-Davidson® 1200 Custom is a high performance, classy bike that’s part of the Harley-Davidson® Sportster Lineup, and it’s available right now at Avalanche Harley-Davidson® on Colfax Avenue. 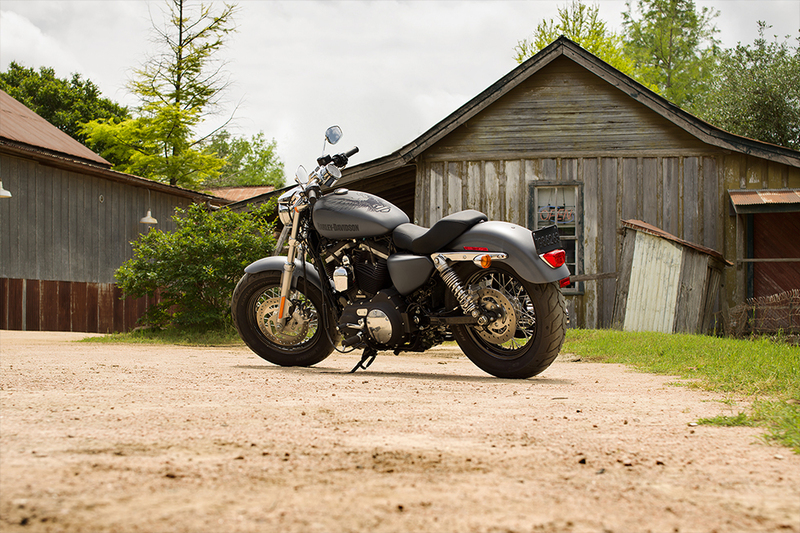 The 1200 Custom is loaded with a huge 1,200cc V-Twin for all the muscle you could ever want on two wheels. Find out why this bike is the perfect fit for Denver, the Front Range and the Rockies. 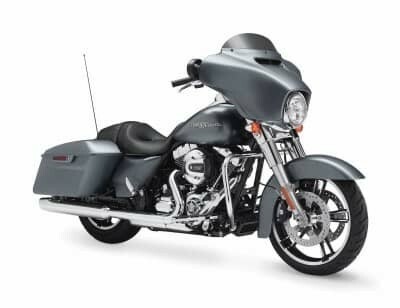 The Harley-Davidson® 1200 Custom gets a 1,200cc Evolution® air cooled engine –known as the Blockhead among its many fans – that cranks out 70.8 lb-ft of torque at 3,500 rpm. That muscle provides plenty of acceleration, and all the power you need for passing, merging, and quiet highway cruising. Plus, with unbeatable air-cooled reliability, the Evolution® will be your constant, trusty companion, for as many miles as you can log along the great Colorado roads. 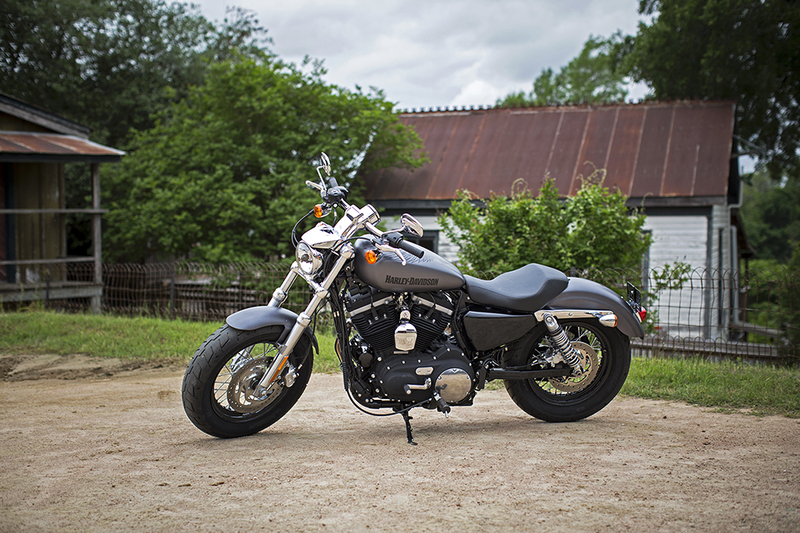 Heritage: The iconic Evolution® or Blockhead engine is the descendent of the Shovelhead and Ironhead engines. This contemporary engine carries on in the tradition of its predecessors with classic air-cooled reliability, while delivering modern features to improve performance. Styling: Nothing is neglected with the Evolution® engine, not even looks. Black powder-coated cylinders, chrome rocker covers, and custom 1200 badging makes this engine an eye-catching statement of Harley-Davidson® power. Innovation: Lightweight aluminum alloy heads and cylinders help reduce the overall weight of the engine to both improve performance and efficiency. Electronic fuel injection makes carburetors a thing of the past and helps improve performance and reliability. The 1200 Custom is designed to devour every mile, and the handling is tuned to provide confidence and control in every situation. Suspension: The 1200 Custom receives a new road-devouring suspension system for 2016 to help improve both comfort and handling characteristics. You’ll be able to tackle the roughest roads with ease. 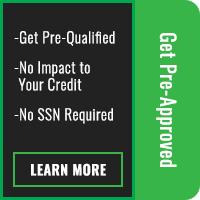 Brakes: To help stop on a dime, you’ve also got an upgraded Foundation Brake System with upgraded calipers and pistons for added stopping power. You can even choose to upgrade to antilock brakes if you want more stopping capability. Tires: Michelin® Scorcher™ tires provide high performance grip and handling in all conditions. These race bred tires will live up to your every expectation. They also offer awesome durability and deep cut tread design to help with water evacuation and wet-condition handling. 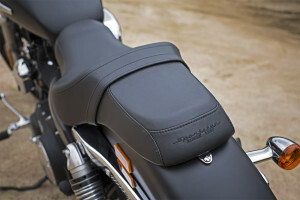 The 1200 Custom is designed to provide all-day comfort for both rider and passenger thanks to several smart features. 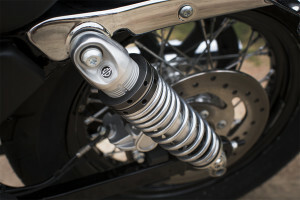 New Suspension: The 1200 Custom receives an upgraded 39mm fork with cartridge damping to provide confident handling and plenty of cushion for rough roads. In back, we went with an emulsion rear shock with screw adjuster giving you the ability to easily dial in the level of firmness that suits the road surface. Forward Mount Controls: Kick back, stretch out, and relax, because the forward mounted controls on the 1200 Custom allow you to enjoy the road without feeling cramped. 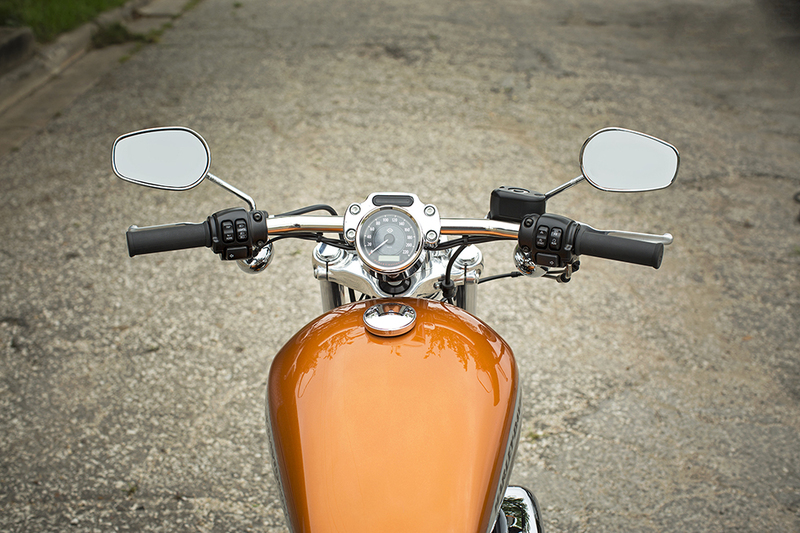 Pullback Handlebar: With a swept back pullback handlebar, the 1200 Custom puts you in an upright, comfortable cruising position that’s perfect for all-day rides. The chrome bar also boasts all your controls right where you want them and easily within reach. Two-Up Custom Seat: The 1200 Custom uses a premium one-piece two-up seat that’s designed to provide a sleek look and all-day comfort. It’s small enough to not look overly big when you’re riding solo, but there’s still plenty of room for a passenger in back. 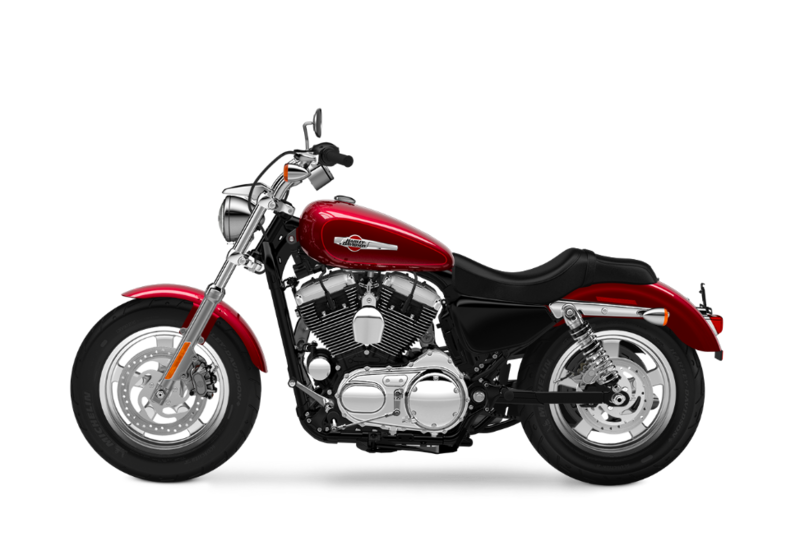 The Harley-Davidson® 1200 Custom is dressed up with gleaming chrome and premium paint. It’s authentic classic Harley-Davidson® cruiser through and through. Chrome 5-Spoke Wheels: The 1200 Custom rides on unique chrome 5-spoke cast wheels that are polished to a brilliant finish for a truly standout look. These bright wheels will definitely turn heads. Lighting: The 1200 Custom is equipped with super bright rear LED lighting to provide excellent visibility in any conditions. With LEDs you also get a low-profile look that keeps the fender line clean and simple. 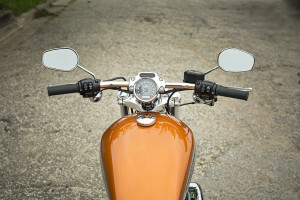 Fat Front End: One distinctive feature of the 1200 Custom is its extra fat front end with beefy triple clamp forks and an oversized front tire. It’s a unique, custom look that’s hard to ignore. While the 1200 Custom might be a relatively affordable bike, it’s still packed with some of the most advanced technology available for motorcycles. Ergonomic Hand Controls: The 1200 Custom gets ergonomic hand controls that are built around your body, providing both comfort and superior handling. They also sport all the controls you need, including the keyless start switch, self-cancelling turn signals, trip switch, and more. Integrated Electrical System: The 1200 Custom, like all Sportster® models, receives a body controller with updated routing for a cleaner look, fewer wiring harnesses, fewer switches, fewer fuses, and less to worry about. There’s even a voltage regulator with modified fins and integrated connectors for better head management. Closed Loop Exhaust System: To handle future emissions regulations, the 1200 Custom receives a closed loop exhaust system that barely reduces the exciting exhaust sound of the Harley-Davidson® while also improving the environment for everyone. Tach and Gear Indicator: It’s simple and easy to see exactly how fast you’re rolling, how fast the engine is spinning, and what gear you’re in, with convenient tank mounted readouts. There’s even a trip computer to track your progress.